Well where do I start….??!!! 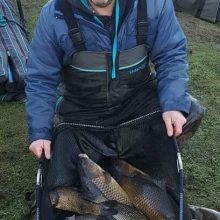 After posting yesterday about being thankful for our match weights of late considering how some of the big venues down south have fished recently, the fishery went a little crazy today, and so did the carp!!! I think we need to remind them it’s WINTER, AND ONLY JANUARY.!! 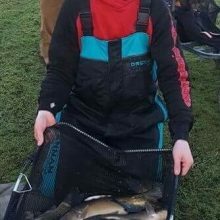 Over 200lbs of fish caught within 5 pegs, unbelievable for the time of year, but it certainly highlights the fisheries potential as it continues to thrive. 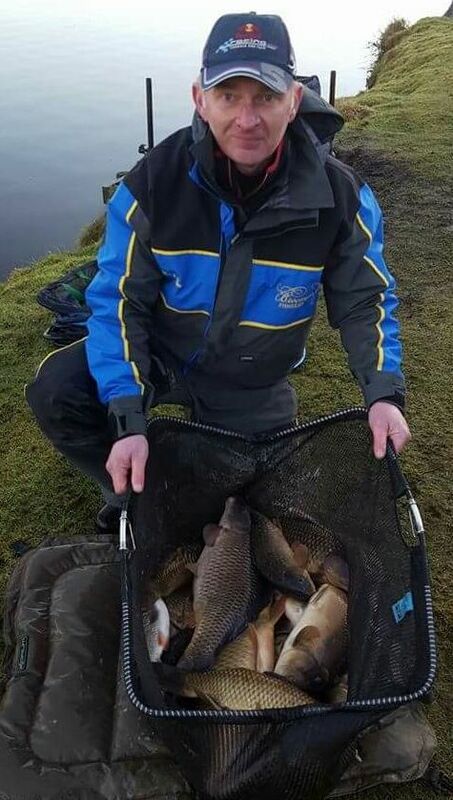 And so to the match, fished on a lovely mild day, with a mixture of sunshine and cloud and not a breathe of wind. If you were fortunate enough to draw on Queensberry between pegs 23 & 27, you were in for a superb winter days fishing. Once they’d figured out the tactics and the ones nearby cottoned on, it soon developed into a bit of a ” fish race “, I can hardly remember a time i looked round and one of the guilty 5 wasn’t playing a fish, and pretty much all day. 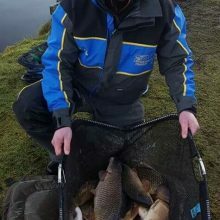 Symon Willan eventually eased ahead to take the section win with his superb 60lb 3oz effort, with every fish caught on bomb and maggot feeder. 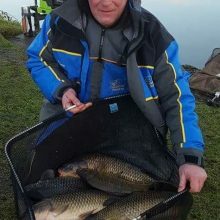 Similar tactics helped Gilbert Pyke to take 2nd place, with another great weight of 45lb 12oz, and extremely close behind was Mark Clow, again on similar tactics finishing 3rd with 44lb 2oz. Also worthy of a mention was young Rob Swan, who’s still learning the venue. 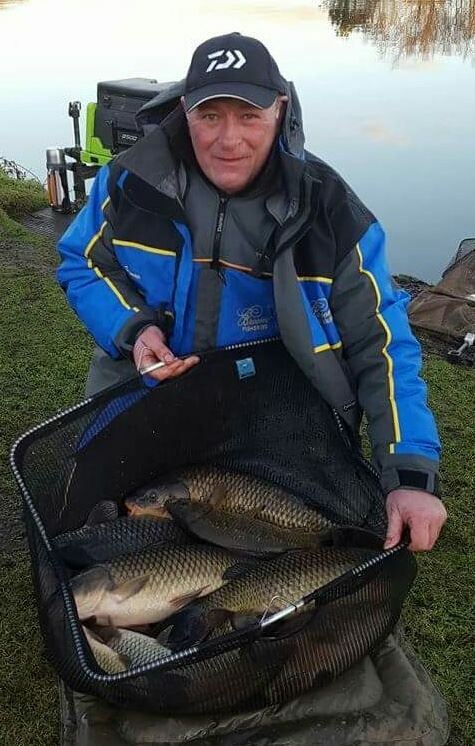 He put 30lb + on the scales – great effort.! At the other end of the lake Carp were caught too, but a little slower and not the same stamp. The two DNW s also caught but tipped back knowing they were out of the running. On Bruces Acre things were a little less hectic, with a handful of carp, chub and ide caught and a few small blades, John Williamson returned to winning ways (only just) after landing an 8lb carp late on to pip the “in form” Michael Harkness to take the section win, and likewise, James Carlton also winkled out a big carp in the dying stages to steal 2nd spot, pushing Michael down to 3rd. 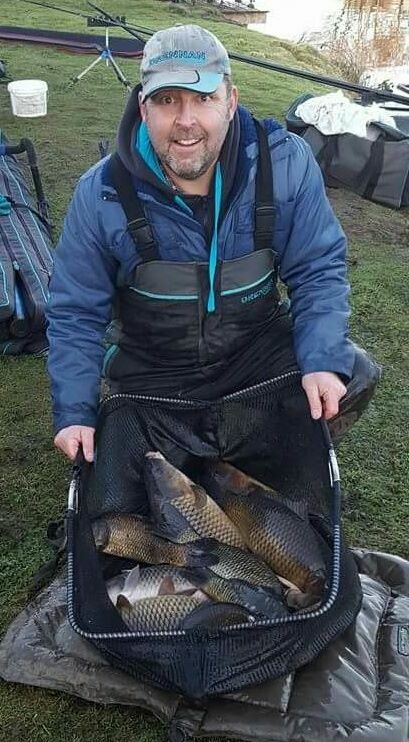 Incidentally, I think I saw ONE ROACH caught in Queensberry today, and only odd chub and skimmers… A different story had it been a “silvers only” match.